Donjon's Sea-Chem 1 heads for open water. "We made this from scratch, from the first plate of steel on the tables, to this," says Milton Lauscher III, assembly foreman for Donjon Shipbuilding and Repair, gesturing towards the impressive four-story vessel looming over us. We are standing near the gate separating Erie Bay from the east graving dry dock where the massive tank barge, Sea-Chem 1, is now floating, nearly completed. "That is what we are most proud of." 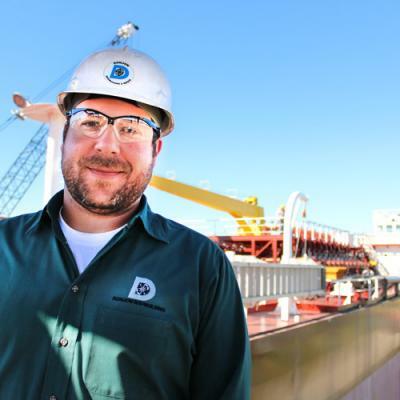 Clear pride of accomplishment shows on his face and permeates the facility as workers scramble to put the finishing touches on the double-hulled chemical tank barge. And it probably has for every one of the last 800 or so days, since construction began in July of 2014 after Donjon won the bid to build for the company Seabulk Tankers. Sea-Chem will be an ocean-going vessel carrying liquid chemical or petroleum cargo. A few dimensions and its weight are all you need to understand this enormous achievement. A few dimensions and its weight are all you need to understand this enormous achievement. Sea-Chem is just shy of the length of two football fields at 584 feet, and is the width of two city buses end-to-end at 78 feet. It was created with approximately 6,000 tons of steel, equivalent to 25 and a half unfueled Boeing 747s. Despite these impressive numbers, Sea-Chem is non-locomotive, meaning it has no engine and cannot move without a source of power. The back end of the barge is designed to accept an engine tug (in this case, the Sea Power, built in Florida) which is married to the cargo barge through a special coupling device. Once together, they are called an articulated tug barge, or ATB. The coupling acts as a hinge, so that, when moving over an ocean swell, for example, the front and the back of the combined vessels can move independently to keep the ship steady. Sea Power contains the pilothouse and all the controls for managing the cargo; Sea-Chem will be unmanned when it plies the seas. According to Project Manager Rick Hammer, this is the first tank barge "new build" completed at the Erie Donjon facility. Consequently, constructing it was far more complex than assembling a typical lake-going freighter. It needed different materials, tighter margins, and the addition of sophisticated safety and pollution-prevention features. "This build was much more rigorous in every aspect, due to the nature of it being a chemical/oil tank barge," explains Hammer. "It required thicker steel, more stringent welding, more regulatory oversight, more extensive testing, more technical coatings, and more specialized equipment and vendors." Precision is vital to meet the standards of the American Bureau of Shipping and the International Maritime Organization (IMO), an agency of the UN. Sea-Chem is classified as a Type 2 tanker by the IMO, meaning it can transport cargo with "appreciably severe environmental and safety hazards which require significant preventive measures to preclude an escape of such cargo," according to the IMO website. 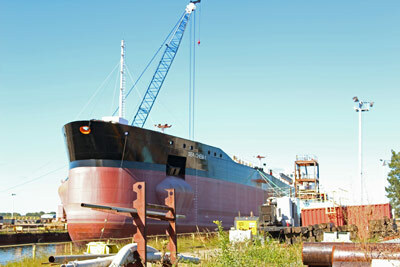 To meet this criteria, Sea-Chem's double hull protects the inner cargo tanks should anything pierce the outer cladding. Further, the deck has a 9-inch tall containment wall, called a coaming, encircling the perimeter to prevent any accidental spills. Within the coaming are two emergency hatches that drain any spills into a spare cargo tank. The barge also has a fully automated system that continuously monitors the atmospheric conditions inside the cargo tanks. "If the sensors detect an oxygen-rich environment that could potentially fuel a fire, it will sound an alarm in the pilothouse of the tug," says Hammer. If this occurs, a non-reacting inert gas can be injected into the tanks, blanketing the cargo and preventing explosion or fire. This is important when you are carrying 185,000 barrels of liquid cargo, which is 7.77 million gallons, divided among 10 separate cargo tanks holding 777,000 gallons each. That amount of fluid is enough to fill approximately 12 Olympic-sized swimming pools or Waldameer's wave pool 15 times over. At port, Sea-Chem can discharge cargo at a rate of 7,800 gallons per minute, meaning that off-loading takes a mere 16 hours. Another impressive number is the quantity of paint and coatings used to spare the barge the ravages of its salty travels. Hammer estimates approximately 20,000 gallons were used. In terms we can all understand, that's 160,000 16-ounce cups of coffee. He also says completing the paint job was one of the greater challenges of the job. The work going into meeting international requirements and making a safe, seaworthy vessel cannot be underestimated. At the peak of construction Donjon employed about 200 skilled workers on two shifts in both fabrication and assembly, which contributed to Erie's economy through regular employment for that two-year period. The pay was hard-earned, as workers faced difficult conditions to complete the job. The Donjon facility is made up of two buildings. The shorter building on the west side contains the long, flat tables (earlier referred to by Lauscher) where the steel is prepared and shaped. The parts are then transferred to the assembly building to the east, the larger of the two. It has a 160-foot ceiling, and contains the 1,000-foot graving dry dock (only one of two that size on the Great Lakes). Both buildings have large doors opening to the outside, and no heat or air conditioning. In winter, then, welders might have to shovel feet of snow in the dry dock to uncover their weld sites. In summer, they may have to lie across hot steel to reach their work. Other workers have their own set of daunting conditions, as well. So when Hammer says, "It takes a special person to work in the conditions we have here," he means it. John Witte, executive vice president and director of Donjon, agrees. "This is not an easy life. As you know weather here can be fickle. Just getting from home to a warm office in the winter is hard enough. These guys work in it every day, but still have a great work ethic and are a pleasure to be around." Lauscher is one of those guys. And he loves what he does. "It's fantastic place to work. And coming from the Upper Peninsula of Michigan, the weather is similar and I find the winters here a little milder," he says, grinning. ready for its departure, which Hammer says, for him, will be the most rewarding moment of the two-year experience. Seabulk Tanker officially took ownership on Friday, Oct. 14. After system tests are completed and passed, Sea Power and Sea-Chem will depart for sea trials on the lake. If all goes well, the new articulated tug barge will head for the St. Lawrence Seaway and, eventually, Port Everglades, Florida: its home port. Although gone, it will take part of Erie with it wherever it goes. As for the employees of Donjon, they are uncelebrated for the most part. They shouldn't be. As Hammer told me, "I am very proud of everyone here and the huge effort they have all put in. Their hands built this barge from raw steel." Clearly, manufacturing in Erie is not dead.